After spending a couple of weeks in Spain, I had grown to enjoy a shot espresso at the hotel. I'm already accustomed to enjoying a cup a day of coffee at work, Mondays thru Friday after lunch. To avoid drinking too much coffee, I wanted to avoid drinking coffee on the weekends. That being said, I ultimately succumbed to purchasing a Nespresso when it went on sale for $60. I enjoy the rich flavor of espresso over coffee. I felt due to the higher concentration in a smaller cup, less of it would have a chance to stain my teeth. Easy to use and quick to make a cup of expresso. Virtually no cleanup... just dump periodically dump used capsules. Maintenance (outside of cleanup) is refilling the water reservoir. Nespresso capsules are 100% recyclable. Free bags can be purchased from Nespresso.com that includes return shipping. Capsules cost as little as $0.70 per shot, which is substantially less expensive than Starbucks, Peets, or any other coffee shops. When I visited Nespresso shops in San Francisco and popup shops in Macy's, the most confusing part for me is the wide variety of Nespresso machines, but made by different manufacturers. Nespresso machines can be made by a number of manufacturers, which for me was very confusing. But from what I understand, they're all technically on paper the same. For me, I chose a Nespresso Machine that I can use in my home office, and I don't particularly want to deal with a milk frother. Since I'm the only one using it, possibly only 2-3 times a week, it's okay for the water reservoir to be on the smaller side for the sake of price. 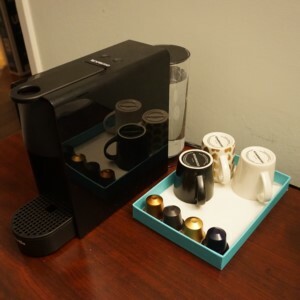 The capsules for Nespresso, Keurig, and Dolce Gusto are all different and not interchangeable. Therefore, decide which machine you want. From a personal taste perspective, I enjoy the Nespresso the most. Keurigs have always tasted less than stellar. And the sample of Dolce Gusto I had at the mall was fairly good, but the advantage here is the variety of coffee types that can be made with the same machine. The number of bars of pressure is the amount of atmospheric pressure applied. The high amount of pressure applied to Nespresso is what generates the superior crema in a Nespresso machine. Some can purchase reusable Nespresso Pods that you fill and pack your own coffee grounds, but doing so negates a lot of the conveniences of owning a Nespresso machine. Therefore, I don't consider those options as viable Nespresso alternatives. There are alternatives to Nespresso Pods, but some of the complaints are that the alternative pods don't hold enough pressure to match the original specification of the Nespresso. This pressure problem is especially true of pods that claim to be biodegradable.